Naloxone is an antidote to opioid overdose. It reverses the effects of opioids by blocking opiate receptor sites. It can quickly restore normal breathing to a person whose breathing has slowed or stopped because of an opioid overdose. Quickly responding to an opioid overdose with naloxone is critical. Just like people with allergic reactions may carry epinephrine injectors, people carry naloxone in case of an opioid overdose. Naloxone can be given by a family member, friend or caregiver and often saves lives in the critical minutes until medical help arrives. Naloxone works within two to five minutes and stops the effects of opioids for 30 to 90 minutes. US Surgeon General Jerome Adams has advised that the following groups of people learn how to use naloxone and keep it within reach: patients currently taking high doses of opioids as prescribed for pain, individuals misusing prescription opioids, individuals using illicit opioids such as heroin or fentanyl, health care practitioners, family and friends of people who have an opioid use disorder, and community members who come into contact with people at risk for opioid overdose. Anyone who receives naloxone for an overdose requires follow up medical care because the effects are temporary. Autoinjectable – EVZIO® is a prefilled auto-injection device that makes it easy for families or emergency responders to quickly inject naloxone into the outer thigh. Once activated, it gives verbal instructions on how to deliver the medication. Prepackaged Nasal Spray – NARCAN® Nasal Spray is a prefilled, needle-free device that requires no assembly and is sprayed into one nostril while people lay on their back. 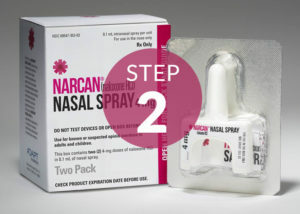 Both NARCAN® Nasal Spray and EVZIO® are packaged with two doses for repeat dosing if needed. They are easy to use and can be used in home emergency situations. The Harm Reduction Coalition’s “Opioid Overdose Basics” page is a comprehensive guide to recognizing an opioid overdose and administering naloxone to attempt to reverse it. Prescribe To Prevent has a range of educational videos about saving someone’s life with naloxone, and you can find links to more videos on our Resources and Reading page. North Carolina has a standing order that allows any pharmacist practicing in the state and licensed by the North Carolina Board of Pharmacy to dispense naloxone to any person without a prescription who meets certain criteria. The order also lets law enforcement carry naloxone and many first responders across the state to carry it with them. It is important to note that pharmacies participating in the standing order are not required to dispense naloxone free of charge; Medicare Part D and commercial insurers vary in their coverages and copays. Many county health departments offer naloxone to their clients or certain at-risk populations. Click here for a list of health departments in North Carolina that offer naloxone. The North Carolina Harm Reduction Coalition (NCHRC) Overdose Prevention Project (OPP) distributes free overdose rescue kits to high-risk groups of people. For more information visit the NCHRC OPP page. Overdose bystanders often do not call for medical assistance because they fear being arrested for drug-related crimes. Since 2007, however, many states have passed “Good Samaritan” laws that provide legal immunity for friends, family and other bystanders, or “Good Samaritans,” who seek medical aid for someone experiencing an opioid overdose. These laws help save lives by prioritizing the victim’s safety and resuscitation over arresting drug users. Nationwide, 36 states and the District of Colombia have “Good Samaritan” overdose prevention laws. North Carolina law protects people who call for help from 911, the police, or EMS when they or another person is having a drug overdose. The law in North Carolina also protects people who give naloxone to someone who is having an overdose. For more information about these laws, visit North Carolina Public Health and Human Services. Download the NCHRC’s Good Samaritan Facts flier. Pharmacists and providers can play a role in encouraging individuals and families to acquire naloxone and learn how to use in in the event of an accidental overdose. The American Medical Association’s Opioid Task Force encourages physicians to consider co-prescribing naloxone when it is clinically appropriate to do so. Prescribe to Prevent offers resources and guidance to physicians considering prescribing naloxone rescue kits. The organization also offers an online educational program to help prescribers, pharmacists, and other healthcare professionals prevent overdoses among patients and their social networks: Prescribe to Prevent: Overdose Prevention and Naloxone Rescue Kits for Prescribers and Pharmacists. Continuing Education credits are available for the training. Pharmacists can play an important role in patient education about naloxone. In states with standing orders for naloxone (including North Carolina), pharmacists are in a unique position to educate pain patients about the risk of potentially fatal opioid overdoses even when the drugs are used legally and offer them the opportunity to acquire naloxone and learn how to use it. To help pharmacists in this responsibility, the North Carolina Association of Pharmacists offers a webinar called The Pharmacist and Naloxone: Opportunity to Save Lives. Continuing education credits are available for the webinar. Prescribe to Prevent offers resources and guidance, including extensive patient education materials to assist pharmacists with patient counseling, billing, and stocking and storage of naloxone rescue kits.